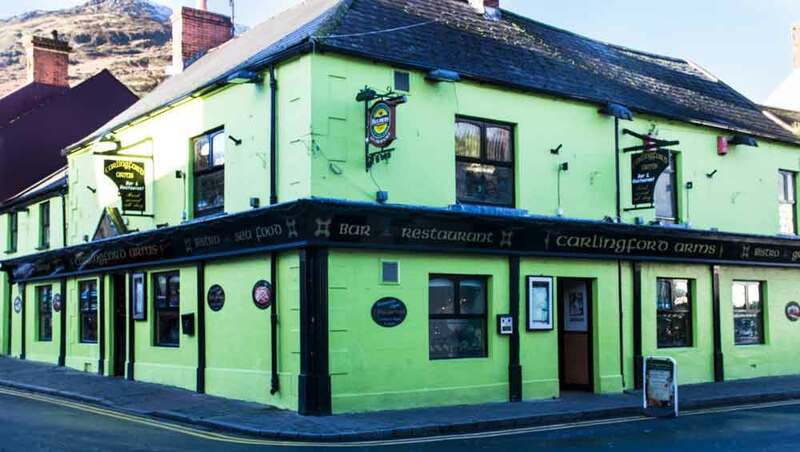 Carlingford Arms proprietor and owner Sharon Mc Guigan provides a very warm welcome, a long-established bar, and restaurant situated in the picturesque village of Carlingford. Wide-ranging menus are available. Including freshly caught seafood, prime cuts of beef from the Cooley Mountains and not to forget our famous SEAFOOD CHOWDER. The selection of food also includes full child’s menu and vegetarian alternatives and our homemade desserts will make your mouth water. Our wine list is constantly being updated with new and exciting flavours to complement the menu. The restaurant enjoys full bar facilities. Children are warmly welcomed and on site facilities include baby changing room and high chairs, wheelchair access and disabled toilets are also available. The main dining room can accommodate approximately 58 people and a separate function room which cater for up to 60 people is also available. Smaller bookings are welcomed. All occasions and tastes are catered for and we welcome any input which would make your special occasions even more memorable.Our delicious food is available to take away and can be supplied to your function whether it is a 21st, a birthday or an engagement party. Throughout the year, the restaurant and bar are open 7 days a week with extended opening hours during the summer period. Bank Holidays and weekend bookings are advisable. All major credit cards are welcome and sterling is accepted. We pride ourselves on our friendly and dedicated staff and they will no doubt make your visit all the more enjoyable.